Welcome to Bed & Breakfast Zevenhuizen. - Top locatie bij Rotterdam! Welcome to Bed & Breakfast Zevenhuizen. In tranquil surroundings, only 5 kilometres from the heart of Rotterdam, we wish you a warm welcome in your own private cottage. Our B&B is your ideal base for exploring the “green heart” of our country and the surrounding cities of Rotterdam, The Hague and Utrecht. Your cottage is equipped with all sorts of amenities, including your own secluded veranda and sunny garden. We offer our guests a comfortable stay in a private cottage, well suited for 4 adults or a small family, in a beautiful environment with excellent biking and hiking opportunities. But also the business traveller will appreciate a stay in B&B Zevenhuizen. We are pleased to have you as our guest! The cottage has a spacious living area, a separate double bedroom, bathroom with shower and toilet, a pantry and a sofa bed for 2. 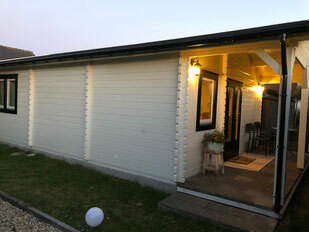 Outside guests can enjoy the roofed veranda and garden with garden furniture. 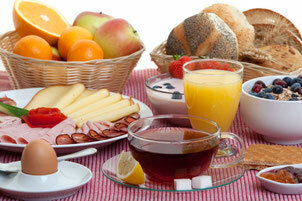 Every morning breakfast is served in the cottage: warm rolls, fresh fruit, boiled eggs, spreads, cheese and yoghurt. Naturally we only serve local produce. Breakfast is served at your request between 7:30 and 10:30 p.m.
Rates are per night, including an extensive breakfast and tourist-tax. Do you want to stay for a longer period? Ask for the possibilities and special rates. Free cancellation until 7 days prior to arrival. In case of cancellation less than 7 days prior to arrival, the first night shall be charged. In case of "No show" the full amount is due. We kindly ask you for payment on arrival. Please be informed that we do not have a pin device. On the day of arrival the cottage is available from 15:00 hours. Please inform us about your estimated time of arrival. Check out is until 11.00 hours. What to do and explore? In the immediate surroundings of our B&B you will find extensive opportunities for relaxation and activities, both winters and summers. You may like to rent a boat and enjoy the local flora and fauna or enjoy an ice-skating trip on the local lakes and canals (weather dependent). In the center of Zevenhuizen you will find local shops and restaurants (French, Italian, Chinese) and various sports and recreational facilities. The village offers monuments you may visit, such as the “Molenviergang”, windmills still in operation. Rotterdam is a modern European city with more than 600.000 inhabitants, offering a wide variety of sightings and activities. The history of the city, the bombardment, the resurrection and the innovation drive with which its inhabitants shape the city until today, makes Rotterdam a mind-boggling and interesting place, a must-visit-city! Gouda is ofcourse world-famous for its cheese, but don’t forget the “stroopwafels”(honey cookies), pipes and pottery. The historical center with many pleaces of interest, authentic shops, narrow medieval alleys, the canals and the many courtyards truly justify a visit. Discover the story of William of Orange, meet Johannes Vermeer and experience the world-famous Delfts Blue. Are you going on a discovery of the cultural Delft? The cosmopolitan and cultural city of Den Haag (The Hague) are home to the Houses of Parliament and the International Courts. Den Haag is the third largest city of The Netherlands and an absolute recommended visit. The seaside resort of Scheveningen is part of Den Haag.